"Turtle Islands" does not sound very romantic, I rather favour another of the old names "Las Encantadas" myself. The Galapagos Group are located on the Equator, and immediately south of, the Galapagos Rise extending from the EPR towards the coast of Ecuador. The islands, originally made famous by Darwin's research and observations of what was to become known as evolution, became later a focus of interest because of the high local magnetic anomaly. However neither the islands nor the ridge is especially enriched in Fe-Ti compared with other basaltic centres, in fact they peak at slightly lower Fe-Ti than do the Hawaiian Islands or the Reunion tholeiites, but ferro-basalt is unusually plentiful nevertheless, similar to Iceland but more so than in Hawaii where rock which have evolved even as far as ferro-basalt are uncommon to rare. A satellite view of a volcano on Isla Isabella, Galapagos, height exaggerated. The Galapagos are one of the six main centres of active basaltic volcanism in the world. The potassic East Africa Rift volcanoes are very alkaline, and the McMurdo-Marie Byrd Land volcanoes of the Antarctic are sodic and very alkaline and hence very different. Hawaii and Reunion are tholeiitic and similarly very LILE enriched, almost transitional, and are dominated by extensive picrite-basalt-ferrobasalt with virtually no icelandite and a single very old example of rhyolite known from Oahu, Hawaii. The Galapagos islands have very similar LILE content to Hawaiian shields but being EMORBs have about 2% higher alumina and higher CaO as have all ORB rocks. The higher alumina gives them a fractionation path quite different to Hawaiian series. Moderately depleted, high-Mg basalts often more basic than those of the Galapagos Islands are well known in Iceland but true picrites are rare and found only from the Hengill area and from Theistoreykjir at the extreme northern end of the ERZ. In the Galapagos picrites with up to 18% MgO are found on the Roca Redonda (Standish, et al, 1998) but are otherwise not known except for a few cumulates in Cerro Azul and Floreana. They trend towards a rather more iron-rich olivine than do either Kilauea, Mauna Loa, Mauna Kea or Piton des Neige, where it is generally close to Fe*100/(FeOT+MgO) of 85 for Hawaii and rather more iron rich, 82 perhaps, in Reunion.. The Galapagos, like Iceland, are also tholeiitic the main centres having a silica content of 48 - 49%, typical of EMORB. The only centres studied in detail, Fernandina, Cerro Azul, Sierra Negrito, Alcedo, Ecuador and Volcan Wolf mainly have a limited range of about 5 -7% MgO, with La/Sm of 2.4 to 3 and Zr/Nb as low as approx 6 in Cerro Azul to 12 in Volcan Wolf. However samples are mainly whole rocks, not glasses and scatter in points is unavoidable. For the other islands there is mainly only old data and at most 1-3 samples done for trace elements. These show rhyolites to occur on Pinzon (as well as on Alcedo) and that some rocks on San Cristobal are sometimes more depleted in LILE than the E-MORB standard. The compositional range is narrower than seen in Iceland, where, due to glacial and post glacial erosion, a wider range in time is exhibited. 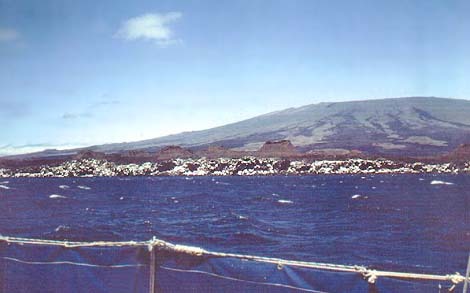 The arid climate of the Galapagos and the frequency of eruption, especially on Fernandina, means only a narrow range in time has been sampled. A drill hole of the HDSP type as put down in Mauna Kea might reveal a much wider range of NMORB to EMORB as seen for example, in Krafla, Iceland. In general the Galapagos volcanoes lie somewhat on the enriched side of the the median for all ORB rocks, the most basic known, Volcan Wolf, being exactly on the median. The nearby East Pacific Rise is dominated by NMORBs and appears to be more LILE depleted though it includes both depleted basalt and EMORB, tholeiitic basalt, ferro-basalt-icelandite-rhyolite. Seemingly by historic accident, few EMORBS have been analysed for trace elements. Geist etal (2005, J.Pet. 46, 2197-2224) shows the difference between the silica content and light REE of the Galapagos Islands and the Galapagos NMORBS. Had the Galapagos EMORB been included the Galapagos islands woud be seen to fall near the median as they do for the EPR or the SEIOR or any other ridge sector. No other ridge includes such a wide range of compositions. Iceland also shows chemical similarities to the offshore Kolbeinsey and Reykjanes Ridges but also has a narrower compositional range. Iceland and the Galapagos have similar overall chemistry with no marked disparities discovered yet. We will show some comparisons below. Some of the San Cristobal rocks are more depleted than E-Type MORB. San Cristobal & Marchena Islands, depleted fingerprints. Volcan Azul, Isla Isabella, Galapagos Is. The Galapagos are built of a series of massive central volcanoes, sometimes lying in NW-SE chains. The main island of Albemarle (Isabella) has an impressive row of broad overlapping shields 4-5000ft in height; Ecuador is a small cone on a peninsula at the north-western extremity, Wolfe, Darwin, Alcedo, and Sierra Negra, form a linear overlapping chain with Azul lying at right angles to the west, the whole forming a reversed 'L'. Fernandina, the most active of all, is an island lying in interior of the reversed 'L' on the western side and has the usual large collapse caldera, flanks streaked with fresh black pahoehoe flows and interspersed with older flows covered in a grey-green leafless shrub. It is constantly changing as Fernanadina has erupted about 12 times since 1813. Small islands such as Culpepper, Wenman, Pinta, Marchena, and Genovesa form a dispersed chain lying almost out of sight to the north, Santa Maria (Charles), and Espanola (Hood) lie to the south east. Chatham (San Cristobal) to the east has had no recent activity but has a lake-filled caldera. There seem to be no post shield-erosion (rejuvenated stage) alkaline series in the Galapagos. Santacruz, (Indefatigable) is a great sprawling shield volcano of excessively barren nature on which the Darwin Institute is located. Marchena, Santa Cruz and Pinta have erupted within historic time but are not currently active. While there is a fair amount of geochemical data, the earlier work of McBirney et al, (1969) included major elements only, while that of White, McBirney and Duncan, (1993, J.G.R. 98) included a variable number of trace elements for basalts only and not of very high precision by current standards. Kurz & Geist (1986, 1999) in a series of papers have presented good data for Volcan Alcedo on Albermarle, but only reconnaissance numbers for other islands, eg their data for Santa Cruz, while obviously more precise, does not match that of White et al, (1993) very well, who also found a wider range of rock type. Baitis & Lindstrom found all rock types up to rhyolite on the small island of Pinzon, lying between Isabella and Santa Cruz (1980, C.Min.Pet.72) but data show considerable scatter. So the Galapagos, one of the world's most important volcanic centres, cannot yet be regarded as a closed book. Reliable data for Ecuador, Sierra Negra, Azul, Alcedo and recently Volcan Wolf has appeared due the work of Dennis Geist and co-workers. However as we know one needs several hundreds of analysed rocks of a wide time span to reach any meaningful understanding of any volcanc island and here we have about 27 islands! Differences in Ba, Rb and Nb on a Zr diagram seems show variations plainly between the centres so far studied. Ecuador appears to have the highest Ba and its neighbour, Volcan Wolf has the lowest. Variation between Galapagos centres. Note that the Ba is present at about half Zr for Volcan Wolf. For Volcan Ecuador (not shown), Ba = Zr. Alcedo, Azul and Fernandina lie between. Nb and Rb also vary in sympathy. Some Icelandic centres, eg, Krafla, Kistufell, Herdubreid, show Ba slightly less than Zr but on a Zr/Nb diagram lie on the Ecuador trend. even though considerably more magnesian. Also low LILE but elevated Ti. An outlying island. More elevated Ti. The single sample of higher LILE is from Ecuador, the centre at the north western end of Albemarle. This time low Ti but elevated Cs,Rb,Ba and oddly depressed Th, U and a wide range of MgO. Sierra Negra, (on Albermarle (Isabella), SE of Alcedo. A wider range but very similar to Fernandina). Alcedo, a large shield on Albemarle. A closely related series of basalts through to high Nb rhyolites. One sample described as "zeolitised' has been excluded. In some diagrams such as Zr/Yb, Alcedo appears to include two different lineages. The Zr range is from 150 to 900 ppm with rhyolites of 71% SiO2. No Ba data is available for Alcedo. The latest data for Cerro Azul is of a single fractionated series together with a few cumulates including a picrite of 18% MgO. The LREE are about double standard EMORB with more enriched higher fractionates. Pm interpolated. The young surface flows of Cerro Azul however tend to be monotonous pahoehoe basalt but many thousands of feet of lava lie below. REE diagram for Volcan Ecuador, with the most basic rocks at twice standard MORB. As REE and other trace elements were done on different samples, a normalised LILE diagram cannot be shown. Ecuador has the highest LILE, with Ba=Zr at 150ppm Zr, Zr/Nb = 8, La/Sm = 3. Pm has been interpolated. REE diagrams for Volcan Wolf. Wolf has 75ppm Ba at 150 Zr and 4.75 - 6.75% MgO. Pm interpolated. The Galapagos Islands. Basalts concentrated at about 7% MgO. A few picrites are seen in as in Iceland but much less than found in Hawaii or Reunion. Only a quite narrow range of composition is exposed at the surface all being close to the median of all ORBs, ie, they are fractionated EMORBs. TiO2/K2O for Volcan Wolf cf the SE Indian Ocean Rise. The local Galapagos Rise is mainly extreme NMORB and the EMORBs present have had almost no TE done on them. If these are compared with the islands as was done by Geist etal, (2005) differences are seen. However using the SEIOR to represent the entire compositional span of ORBs it is seen that the Galapagos islands as exemplified by Volcan Wolf, fall in the median zone for all ORBs. All ORBs compared with Galapagos for Zr vs Nb. It may be seen that again the Galapagos Islands cover about 1/3 of the total span of composition of the Oceanic Ridge rocks. Alcedo which is fractionated to rhyolite shows by far the greatest span of composition to 900 Zr, 90Nb. Wolf and Ecuador which are low Mg basalts cover a much more limited range. Parental melts lie to left of the EMORBs. It appears that median MORBs fractionate TE to a greater degree than does NMORB rhyolite (lower right). Nauman, Geist and Kurz, (2002,J.Pet. 43,859-883) have recently added more data for Volcan Azul. Being close to Kilauea - Mauna Loa, the Galapagos volcanoes could in most cases be distinguished from them chemically only by their higher Al2O3 and CaO contents. When normalised to BHVO standard, Volcan Wolf shows LILE close to 1, except for slightly higher Eu. The Galapagos form the tholeiitic extreme for islands of the Pacific, (though less extreme than the EPR.) The tholeiitic Eiao Shield in the western Marquesas Islands overlaps in some characteristics. The contrast with other more alkaline islands of the Pacific is extreme as seen below. Zr/Nb for EPR, Alcedo, Eaio, Mehetia (Society Group, Austral Is and Tubuai. Note the centres are reversed relative to the previous diagram. ie, high Yb = low Nb. Nb/Yb for EPR, Alcedo and Tubuai. Just as Iceland allows us to examine sections of spreading ridges subaerially, the Galapagos reveals at least part of the fractionation paths for the median EMORBs rather better than is seen in Iceland. It is understandable that off-ridge volcanic centres should be more LILE enriched, but why such a large centre of volcanism should be massed in a retricted area and only on the south side of the speading centre is a puzzle. The restriction of composition to median ridge, precludes any deep-seated "mantle plume" origin. The Revillagigedos consist of four main islands, Socorro, Clarion, San Benedicto, and Roca Partido which lie near the East Pacific Rise, north of the Galapagos and about 300 NW ml SW of the end of the California Peninsula. The main island of Socorro is an alkaline basaltic shield type with a large caldera 3.5 km diameter in which are a series of post-shield trachytic domes. Though Bryan (1966, B.Vol. 29) had termed these rhyolites, all are high Nb and only one of sixty samples plots in the rhyolitic field. Some verge on pantellerites having high alkalis to alumina but most would term them them "commendites" though this name is not precisiely defined. Though more elevated in HFSE, the Socorro rocks are close to those of Ascension Id in the Atlantic. Though slightly more enriched, they ae also similar to the Galapagos EMORb volcanoes. Soccorro Id (Bohrson et al, 1997, J.Pet.38) consists mainly of trachytes-quartz trachyte but with a wide range in some elements nevertheless. As seen, the Revillagiedo rocks have an remarkable range in HFSE. Iron is high averaging about 8% which results in, or is the result of, many iron minerals including fayalite, ilmenite, ferro-acmite, aegirine and aegirine augite, while Ti is under 1%. Zr runs up to over 2000 ppm and the Zr/Nb of an average of 7.0 tend to split into two trends at high Zr-Nb levels. The Socorro trachytes thus lie half way between the EPR and the Tubuai nephelinites and are somewhat more alkaline than the hawaiites of Mauna Kea. (West, Garcia, Frey & Kennedy, 1998) and much more so than the tholeiites of Alcedo, the Galapagos volcano. The La/Sm is quite regular at 4.0 but Ce values seems to be erratic, even when displayed against La. Rb shows a wide range of 40-170 ppm while K stays almost constant near 4.5-4.6%. The Na/K + Na ratio is almost constant at 0.75 being controlled by the low T trough in the system Ne-Leu-Silica. Th/U is fairly constant at 4 compared with 2.5 for the EPR. The collapse of Ba in the more evolved trachytes gives rise to some remarkable variation diagrams in any including Ba. All, (other than the island arc members of Tonga etc.) are alkali basalt, eg Marquesas, Tahiti group, Isles Sur le Vent, Rarotonga, Samoa etc. It is probable that the large cones all have a core of tholeiite as this keeps turning up. eg a large centre such as Rarotonga, if drilled would probably reveal tholeiite at depth of a thousand feet or two. The chains of atolls of the Tuamotus are coral growths on the summits of alkali basalt domes, now submerged. When drilled, the coral of atolls soon passes into basalt, as in Mururoa. Pitcairn, being closer to the Mid-Pacific Rise, is more tholeiitic. The eroded remnants of a typical Pacific alkali-basalt volcano. This isolated group 3,000 miles west of the Galapagos consists of seven main basaltic islands (Nuku Hiva, Uapou, Hiva Oa, Fatu Hiva, Etao, Ua Huka, Tahuata) all of Pliocene age and deeply eroded though standing 2000-3000ft ASL. Variation diagram for the Marquesas Islands. Alkali basalt, basanite grading to trachytes - phonolite, (with 10% Na2O). Phonolites come mainly from the well-known phonolite necks of Oua Pou. The Eaio Shield drill core rocks are mainly termed "alkali basalt" though some are perhaps transitional. However the basic rocks grade through picrite toward olivine, not ankaramite. The phonolites have high alumina, and no pantellerites are present. Also note complete lack of ferrobasalt. The Eaio Shield, western Marquesas. An unusually regular cluster of basalt primary melts, with 2-3 ankaramites and oceanites, a couple of hawaiites and a single mugearite. Note the moderately high K and Rb, compared with, say, the Tubuai nephelinites shown below. The Eaio rocks are mainly basalts-hawaiiites with no trachytic members and again we see a similarity to the Galapagos islands..
LILE elements normalised to EMORB for the Ua Pou phonolites. In this data set only a dozen samples were determined for U, Pb, Pr and none for Cs or Lu, but the similarity to the Dunedin phonolites may be seen with rapidly declining Ba in the highest fractionates. Ti, P, Sr, Zr also decline in late stages. This elongated cluster of approx. 50 atolls must lie on a sinking crustal block, as I do not believe that a single one has emergent basaltic rock. Only Mururoa lying somewhat south of the eastern end of the Tuamotus has been drilled down to basalt, but I do not know the thickness of coral penetrated. They are all very low lying at best a few feet above high tide, so the are also known as the "Low" or "Dangerous" Archipelago. From a distance of a handful of miles only the tops of coconut trees can be seen. All the atolls form round or oval rings having grown above the rims of craters or calderas. This string of islands, Pitcairn, Mangareva, Mururoa, and the Duke of Gloucester Islets lie to windward of Tahiti and Mehetia and are really part of the Society chain though separated by about 100 miles. Henderson, a prominent island, lies about 100 miles NE of Pitcairn and lies neither in the Tuamotus nor in the Gambier chain. This island of "Bounty" fame is an eroded remnant less than 4 miles across and cliffed most of the way round. One inaccessible bay is named "Downrope"! Data is sparse. Some years ago I analysed a dozen rocks from Pitcairn and now wish I had done 50 as this island shows clear-cut OIB hawaiite-mugearite-trachyte trends with no K or Rb negative anomaly, the Na/K ( i.e., Na2O * 100/(Na2O + K2O) being about 78, Gunn & Coombs, 1972, unpub. Data). TiO2 has a high of 3.6% and the TiMt IN point occurs at 4.5% MgO as usual. Apatite IN is at 3% MgO and 2.4% TiO2 while iron has a maximum of 15%. The nearby Pitcairn seamounts, (Woodhead and Devey, 1993) are similar but with slightly lower iron, (14%). A fingerprint of a few samples (Woodhead & McCullock, 1989) is remarkable only for rather high Th and low Cs. |__| Examples of Pitcairn including a trachyte. As a Pacific island, Easter Island is atypical, being rather low, flat, dry and barren with no harbours, few coconut trees and all that goes with them and with roads that are hell on tyres. (my apologies to the inhabitants, who love the place!) In spite of this it has attracted the attention of a good many well known geologists; it must be those statues! Lacroix (1928), Lacroix (1936), Chubb(1933), Baker et al (1974), Bonatti et al (1977), Clark et al (1977) between them produced a fairly large amount of data, the older showing the usual unreliable Mn, Na, K, P values. However, Easter Island is a classical alkali basalt, hawaiite, mugearite, benmoreiite, trachyte, quartz trachyte association. Only the data of Puzankov(1997) includes any significant trace elements, and these for alkali basalt - quartz trachyte only. If the best geologist is he who discovers the most rock types, the prize goes to Peter Baker, then of Leeds. 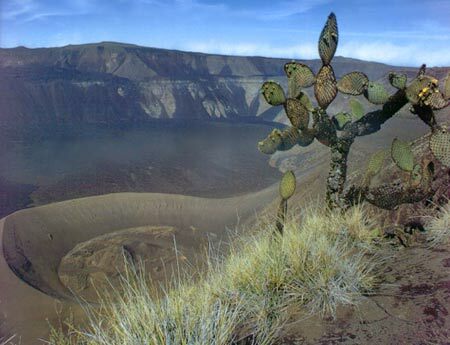 Easter is triangular in shape with a gently sloping shield volcano, Terevaka to the north, an older centre, Poike to the SE and a younger centre (Ranu Kau) to the SW with a deep crater in which lies a weedy fresh-water lake. The series is remarkable only for its rather elevated HFSE and the low K and Rb. Total Alks reach a level of 10.5% at 66% SiO2 and then declines in the commenditic rhyolites.. Variation diagram - Georoc data. This diagram is unexpectedly varied, but it seems some basalts are quite enriched, almost basanites, with a range of total alks of 3 - 4.5%. The alumina for the enriched rocks is also elevated. Except for the more alkaline basalts, Sr and Ba are both < Zr, while Y>Nb>Rb,, rarely seen in Pacific islands. La vs Sm, showing a range of about 3 - 5. 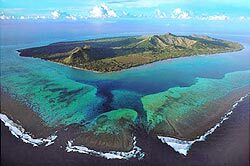 Mehetia is a small island lying about 60 miles SE of the Taiarapu peninsula on Tahiti. Moorea is physiclly similar to Tahiti but somewhat smaller being a deeply eroded high island about ten miles to leeward and in plain sight of Tahiti. Papeete is the main town on Tahiti and is the administrative and tourist capital of French Polynesia, due to the deep lagoon behind a fringing reef which forms an excellent harbour. The island is massive and deeply eroded but narrow valleys exposing syenites, yamaskites and gabbros in the core, (McBirney & Aoki, 1968). Cheng et al (1993) give partial data for Mehetia, Tahiti and Teahitia, which last I do not know and is not shown on nautical charts. The Na/K ratio is about 60% throughout the group, though the Mehetia series seems to curve towards oceanite rather than ankaramite in the cumulative rocks (Binard et al 1993). On some plots Mehetia seems close to the Eaio Shield but on a Zr/Nd or Zr/La plot, while both Mehetia and Mangaia lie between the Tubuai nephelinites and the Eaio hawaiites-mugearites, and they are distinct. Hemond et al (1994 include 30 partial analyses for Teahitia and Mehitia which show a similar type of basanite of restricted compositional range and a close adherance to the Na/K of 60%. The MgO range is 6-17% with oceanites rather than ankaramites. The MgO/Ni distribution is very precise and only a little less steep than Kilauea, as is Mg/Co. Compared to the Eaio Shield of the Marquesas, Mehetia and Teahitia are both more potassic and more Nb enriched, Zr/Nb = ~7.25. |__| Ternary Na-Mg-K for Mehetia-Teahitia and Eaio. 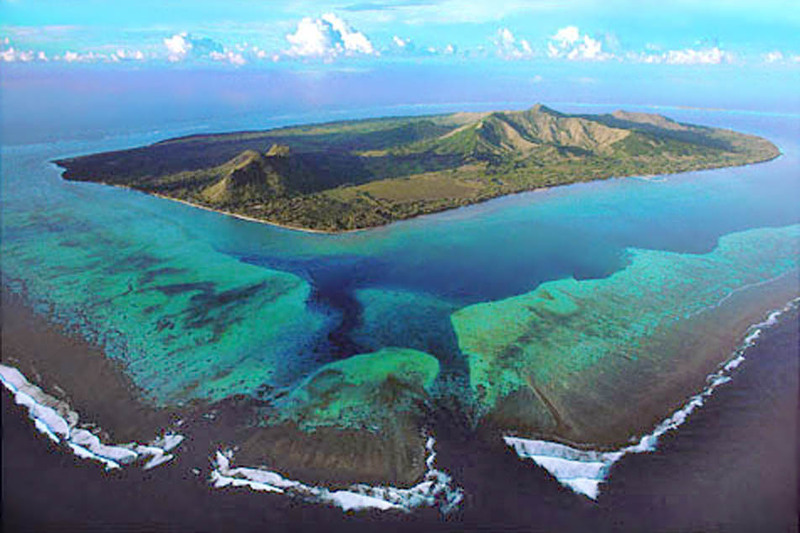 Moua Pihaa is another small alkali basalt island near Tahiti, (Hemond et al (1994). It is less potassic than Mehetia-Teahitia, being close to Eaio in the respect, but has a Zr/Nb of ~6.4. Because sets of partial REE data often do not overlap no comparison can be made of the REE levels. Tahiti has rather high Zr/Nb of 6.0 and a Zr/La of 7.1. Moorea is even higher at 9.6 and 11 even though a phonolite is included. Possibly the youngest post shield or late-shield rocks have been eroded away. Variation diagram for Moorea and Mehetia Islands. These two islands are similar, slightly less alkaline than Tahiti, but more of the evolved trachytes etc are found on Moorea. Moorea and Mehetia - Zr vs Alkaline Earths. Sr and Ba both exceed Zr with a maximum > 1000 and 750 ppm, Rb = Nb and both exceed Y, very different to Easter Island..
Moorea and Mehetia - MgO vs metals. The steep and linear Ni would suggest oceanites, but declining CaO with higher MgO shows cumulates are ankaramites. Variation diagram for the Society Islands, (Tahiti, Moorea, and Iles sur le Vente). Intrusive essexites, yamaskites and gabbros of Tahiti which have very erratic compositions have been removed. Nb/Zr diagram comparing Eaio Shield in Marquesas with Tubuai nephelinites. |__| Zr/Nb for Tahiti and Moorea cf Tubuai nephelinites. The Zr/Nb is about 7 for Moorea but with a wider spread , (3.5 - 9) in Tahiti. As the name intimates these islands lie about 100 miles downwind from Tahiti, all are large, though not so high as Tahiti and Moorea, with deep eroded harbours and offshore reefs with deep lagoons, (and plenty sharks). Ruahine, Raiatea, Taha'a and Bora Bora lie withing sight of eachother with Mopelia and Maupiti off to the west or NW. White(1996) has presented partial data for 3-4 samples from each of the islands of the Society Group and les Isles Sur le Vente. Some variation in, eg Nb/Zr is seen but there are not enough samples to distinguish whether there are inter-island differences. |__| Society Is and Isles Sous le Vente. Photo by Caputo, courtesy of Don Travers. These lie S and W of Borabora including the sea-mounts and islands (from SE) MacDonald, Marotiri, Rapaiti, Raivavae, Tubuai, Rurutu Rimutara etc. Oddly enough the data from this seldom visited group are better than anywhere else in the Pacific. Caroff (1997) has a data set from Tubuai, which includes a series of nephelinites and basanites. Dupuy (1998) presents data from a few samples each for the whole group, for Marotiri, Rapa, Rurutu, Raivavae, Tubuai and MacDonald. All are basanites trending to nephelinites and phonolites, no hawaiites, mugearites or trachybasalts are included. Nevertheless a Zr/Nb diagram shows at least two main trends, one being Tubuai and Rapa with Zr/Nb of approx 2-3, and the other of about 5 which seems to embrace all the other islands, so the Tubuai trend is almost unique with a average Zr/Nb of only 2.95. Interestingly the Nb/La is identical throughout the group though the Austral Is are somewhat higher in Nb than the Society Group which is much higher again than the Eiao hawaiite-mugearite shield in the Marqueses. Palasc(1986) also gives data consisting of 3-4 samples each for islands (including Samoa and Rarotonga also), for Rurutu, Rapaiti etc of the Austral Group (but not Tubuai) These confirm the lower Nb of the islands excluding Tubuai. Zr vs Nb. The high Nb trend is found on Tubuai and Rapa, however there is a complete range in the more basic rocks and ones which have fractionated may be quite accidental. SiO2 vs Alkalis. Alkali basalts in the centre surrounded by transitional to tholeiite (lower right), ankaramite-oceanite (lower left), basanite to nephelinite, (upper left) and a few hawaiite-mugearites to right leading to a handful of trachy-phonolites. This seems typical of any large group of Pacific OIBs. Zr vs Alkaline Earths. Sr exceeds Zr in all rocks as does Ba except in a few transitional types. Nb exceeds Rb and the divergence in different centres can be seen. MgO vs metals. A wide scatter in Cr. V falls at about 4% MgO., low Cu and Zn. Fingerprint for Tubuai. The data are incomplete and Th, Pr, Pb and Sm have been interpolated. This to the present is the most interesting diagram for all the alkaline islands. Note the very negative K and Rb, (=high soda), the high Th and the +ve Nd anomaly. However, on an REE diagram, Nd is not higher relative to Sm Gd etc, so it must be that the P,Sr, Zr and other nearby elements are lower relative to the REE. So why is Nb/La the same as in the Society Is????? Does Tubuai hold the record for the highest Nb of all basic volcanic rocks with up to 150 ppm? Not really; interestingly Mahuvura in the western arm of the E. African Rift has the same levels of Nb, the same high relative Nd but no negative K or Rb being potassic. As seen below, even the fairly ordinary island of Taha'a has up to 330 ppm Nb in phonolitic trachytes. Again, the Nb/Y ratios have little meaning as the trends do not pass through the origin of a graph, so ratios are not constant in any one series. The others are not only linear in any one series but do pass through or near to, the origin. Much the same compositions seen in Tubuai are seen in the East Greenland melilite nephelinites though the latter are lower in Nb and like the bermudites, higher in Ti-Fe, ie they are melanephelinites. Tubuai variation diagram. The high soda nephelinites and analcitites make these rocks appear to be heterogenous, but on most diagrams they appeare to be more or less a single series. K is low but higher in nephelinites. The data is patchy with many gaps. Tubuai Zr vs Nb. Here we see Tubuai with very high Nb and Zr/Nb about 2.5-3. Taha'a in the Isles Sous la Vente has much lower Nb with Zr/Nb of about 6.5. For comparison the Island Arc rocks of Tanna in the New Hebrides are included, Nb is vanishingly low as in all arc rocks. Tubuai Zr vs AE. Note very regular Ba, Sr, apparently fractionated and the high and regular Nb. Nephelinites tend to be on the right but many samples are not named or have no ME. Tubuai La vs Sm. Here we have a surprise. Basalts of Tahaa have much higher La/Sm than the more sodic Tubuai while for the Island Arc Tanna, La and Sm are both vanishingly low. The high Sm, low La sample is simply labelled "Basalt". It appears to be an error. MacDonald is the name given to a seamount at the south-eastern end of the group, for which there is a large amount of data from dredged samples. It is not shown on most charts and has a summit at -30ft (6 fm). Thirty samples by Hemond et al (1994) show alkali basalt to basanites with two hawaiites, no nephelinites. The Na*100/K +Na = 70 but little fractionation has taken place. The Zr/Nb is distinctly higher than Tubuai ( 5 ) but not far removed from other Austral Islands though 2-3 slightly different but parallel trends are present. Rarotonga & Southern Cook Is. The main island of Rarotonga is a massive dissected dome. It has not sunk as much as those of the Society Is so there are no deep harbours, merely a fringing reef. Coarse gabbros and ankaramites may be found in the islands interior. Palasc (1986) includes a single ankaramite, an alkali basalt or basanite and a phonolite from Rarotonga. They are in general similar to the Austral Is but with so few samples no demarcation can be drawn. Variation diagram for the southern Cooks. Nephelinites mainly from Aitutaki. La/Sm. A cluster of La/Sm = ~15 is from phonolites of Rarotonga compared with about 5 for more basic rocks from the other islands. REE vs La for the Southern Cooks. La shows a restricted range compared to the Austral Islands with La = 18 to >150 ppm. Rarotonga shown especially by the low Nd. Though politically part of the Cook group these islands are geographically more a north-west extension of the Austral Group. Atiu is a low volcanic island with a fringing reef; Aitutaki a low atoll with a large lagoon on which our flying boats used to land. Three of the peripheral islets are volcanic. Samples (Palasc,1986), of basanite-nepehlinite are slightly more potassic than Tubuai and similar to the rest of the Austral group. Islands of the southern Cooks include (from North) Palmerston, Aitutaki, Marivae, Takitea, Atiu, Mitiaro, Mauke, and Mangaia. This island is the to the SW of the Austral Group, again, lying SE of Rarotonga. Rather less alkaline than Tubuai it consists mainly of basanites but with slightly less Nb and more Y than Tubuai. The Th/U at 4.0 appears to be the same. Like Tubuai, Mangaia has very high Pb 208/204 and 206/204. Variation diagram for Mangaia. Very sodic but no nephelinites present. Shown against Zr, the Ba, while greater than Zr, remains well below Sr in amount while Y exceeds Rb. EMORB normalised diagram for highly sodic basanite-phonolite from Mangaia. Mangaia and Tubuai have very similar fingerprints and on an SiO2/Alks diagram, both include similar basanites but Tubuai extends on into low Si nephelinites. How similar are other element ratios? The answer is that there are quite distinct differences even in the basic members. Both have similar Ce/La (=1.96) but for La/Yb Tubuai has the higher La throughout, and the higher Nd and La in Zr/La and Zr/Nd. In Zr/Nb and Nb/Y Tubuai has the higher Nb while Mangaia shows a spread of values from ~ 4 to 6. The Samoan chain includes (from NW to SE) Savaii, Upolu (Apia), Tutuila (Pango Pango), and the Manua islands including Ta'u and the seamount Vailulu'u which creates heated water currents in it's crater. The last major eruption took place in the group on Savaii in 1905, but the islands are taken as younging to the SE. As all other centres lying east and closer to the East Pacific Rise are extinct, Samoa must owe it's origin to the proximity to the Tongan Trench. However, Samoa lies far enought to the north that it is unlikley to be subducted. It has two main Zr/Nb trends (as yet unidentified) of about 7-8 (near transitional) and 5 and is thus less alkaline that most of the islands of the central, southern Pacific. Unfortunately no adequate maps or pix available. Major element data by MacDonald, (1968), Stice (1968), Natland, (1980) and others show a series of near-OIB alkali basalts with a few hawaiites, mugearites trachytes on the island of Tutuila. A few data from Hauri (1997) from the main island of Savaii show only OIB-like basalts. Variation diagram for Samoa. A wide variation in K2O, the low K rocks being mainly from Ta'u. The high and variable TiO2 (4 - 6%)do not seem to be affiliated with any one centre. Zr vs Alkali Elements for Samoa. Th vs U & Pb showing wide range in leads. La/Sm varies from 3 to 6 and the maximum La is only 85 ppm. Th/U is constat at 4 but Th/Pb is variable from 0.5 to 1. The isotopic ratio Pb 206/204 vs 208 /204 is also unusually variable. This chain including Ponape, and Truk, might be though at first glance to be yet another arc. They are however a series of nepelinites, basanites, alkali basalts, with a few ankaramites. The only data, that of Mattey et al (1982, C.Min.Pet 80) is now somewhat dated. The Auckland Volcanic Field is a cluster of about 40 small basaltic cones of Recent age. 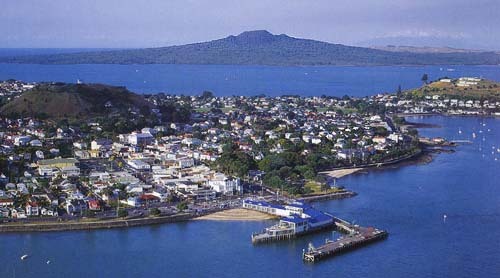 The youngest, Rangitoto Id, (shown below) is thought to be only 600 years in age and was probably built in a time of only 10-50 years. Two slightly older cones are seen in foreground. Composition is close to average OIB. Building a city of more than a million in the center of such a field cannot be thought of as logical. Early explorers saw only the useful harbour, not volcanoes. The Auckland basalts are close to OIB average, but are very magnesian (10-13%), have a small compositional spread and show some ankaramite trends. Once again we see the ability of alkaline basalts to be intruded into or at the edge of continental masses without modification. Prehistoric (10-15,000yr) centres in the Auckland Volcanic Field. Browns Id. This consists of an older sea-eroded tuff cone plus a younger centre. Notice the wild Th point. These wild values are something of a puzzle! Or is it a misprint?? though rather less magnesian.A plio-Pleistocene field south of Auckland, NZ. Several old Pliocene alkali basalts domes are found on the east coast of the South Island of New Zealand and more on subantarctic islands. All are deeply eroded and partly submerged due to post-glacial sea-level rise, often forming magnificent harbours. This promontory on the east coast of the South Island, NZ, is formed of two overlapping Miocene-Pliocene volcanoes, Lyttleton and Akaroa . Both have been deeply eroded and then flooded by post glacial sea rise, the radiating valleys forming numerous harbours. 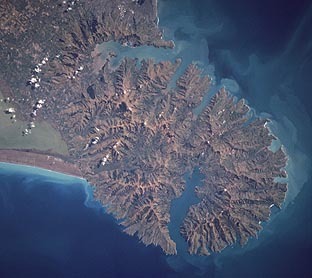 As seen in the satellite view, the major bay to the north forms the harbour of Lyttleton and once drained the Lyttleton caldera. The Gebbies pass ryholite referred to below occurs at the southern limit of the Lyttleton Harour and valley. The harbour of Akaroa to the south is of similar origin. At the extreme northern end of Akaroa is a small peninsula within which is found the Onawe Gabbro and Syenite. The flows of both centres are mainly of hawaiite, with basalt, mugearite, benmoriite and trachyte occurrring mainly as dykes. The Lyttleton dome or shield was formed between 12 and 9.7 myr ago ( Price, R.C. & Taylor,S.R., 1980, (C.Min.Pet 72, 1-18). The larger Akaroa dome was formed between 9 and 7.5 myr. Price and Taylor believed that Akaroa is a more alkaline centre, but the data is minimal and while considerable scattering of alkali data is seen it is not consistent with the lack of variation in the REE. |___| Variation diagram for both volcanoes, data from Price and Taylor. These lie immediately east of the city of Christchurch, the two centres overlap with a basal diameter of about 30 miles. No trace element data is yet available. There is a wide spread of composition, with end products ranging from trachyte to rhyolite. No basanites or phonolites are found. The "rhyolites" are more likely to be quartz-bearing commendites. Lyttleton and Akaroa Volcanoes. Very old data, no trace elements. On an Alks/SiO2 diagram there appear to be three series, some quartz-bearing "rhyolites", an alkali basalt - mugearite - benmoreiite - trachyte series, and a basanite trachybasalt - trachy phonolite series. However these do not show distinctly on the variation diagram nor are they confined to one centre. Even the Gebbies Pass Rhyolite while of lower alumina fits in with the general trends. More data is needed! (or the East Otago Volcanic Province). This major Pliocene province consists of a large deeply eroded central volcano centred near the city itself with many peripheral vents (some estimates go as high as 150) with lopoliths, domes, massive flows and residual plugs of alkali basalt, basanite, theralite, trachyte and numerous phonolites of extreme composition, (See "Rhyolites, Trachytes, Phonolites"). Rb is high in the phonolites (~300 ppm) as is Th (~67 ppm) with a Th/U of 7.1. Zr/Nb diagram for Dunedin Volcanics. Zr/Nb averages 5 with extremes of about 4-7, higher than seen in nephelinites. Nb in some of the phonolites especially Mt Mopanui, is very high (~300 ppm) as is Rb (~300 ppm) though Ba seldom exceeds 1000 ppm and falls to almost zero in the phonolites. Zr/AE diagram for Dunedin Volcanics. The lavas of the Dunedin or East Otago Volcanic Province surround the university city of Dunedin, and have been intensively studied over the years beginning with the pioneering work of the well known historical figure of Professor Benson in the First World War era. Benson was only one of a group of famous petrologists trained by Sir Edgeworth David of Sydney. David and his student Mawson were of course with Shackleton in the Antarctic in 1907 when "Shackles" reached a point only 90 miles from the South Pole, while David and Mawson walked to the South Magnetic Pole! "Benny" did the petrography of all the rocks collected including erratic samples of Ferrar Dolerite. In 5 years of work I seldom found anything mineralogical that "Benny" had missed, and he was using an ancient brass microscope with plates of calcite as nicol-prisms! These consist of the eroded remnants of a chain of alkali basalt centres forming islands 300 miles south of New Zealand. The most obvious centre is that at Carnely Harbour, where the data of Gamble shows numerous ankaramites to be present. No REE available. This volcanic island group is only 24 miles long, built of shallow dipping flows of about Pliocene age, deeply indented by Pleistocene glacial fiords on the north-east, pounded by the westerlies into steep cliffs on the south-west and west sides. Carnely Volcano is an eroded centre on the southern end the island, the one-time crater forming a large harbour, as in Lyttleton-Akaroa. Data is rather old and variation in K suggests alteration. Only mildly alkaline as shown by the low if variable soda. No TE or REE. These lie about 250 miles SE of the Auckland Is. Glaciated Pliocene alkaline basalts resting on schist with one deep harbour. No data.